Palestinians protest against Israel’s use of snipers to target children, during a protest east of Gaza City, 13 July. Israeli snipers killed a child on Friday as Palestinians marked more than 100 days of Great March of Returnprotests in Gaza. 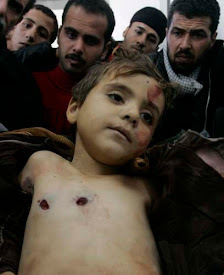 Uthman Rami Halas, 14, was killed by live fire, according to the human rights group Al Mezan. Halas, from the neighborhood of Shujaiya, was shot in the back by Israeli forces stationed across the boundary east of Gaza City, the group stated. More than more 100 people across Gaza were injured, 65 with live ammunition. Palestinian media circulated this photo of Halas following news of his death. Video showed distressing scenes as relatives mourned over Halas’ body at the morgue of al-Shifa hospital in Gaza City. Before Halas’ death on Friday, the UN humanitarian monitoring agency OCHA reported that 21 children were among the nearly 150 Palestinians killed by Israeli forces in Gaza since 30 March, the vast majority of them during protests. More than 4,000 others have been wounded by live fire. During the same period, four Israelis have been injured. For the 16th Friday in a row thousands of Palestinians headed towards Gaza’s eastern boundary. Since 30 March, Palestinians have been mounting protests against Israel’s 11-year siege of Gaza and to call for the right of refugees to return to lands from which they were expelled and are excluded by Israel because they are not Jews. Israel has responded by deploying snipers with orders to shoot unarmed civilians including children – killings and maimings the International Criminal Court prosecutor has warned could lead to Israeli leaders being tried for war crimes. The theme of this Friday’s protest was solidarity with Khan al-Ahmar, a Bedouin village near Jerusalem which faces imminent demolition by Israel – a war crime – to make way for more Jewish settlements in the occupied West Bank. Many Palestinians in Gaza addressed messages to the people of Khan al-Ahmar through local media. This image shows a Palestinian waving the Irish flag in honor of the Irish senate’s passage earlier this week of a bill to ban the import of goods from Israeli settlements. As Palestinians in Gaza sustain their revolt against the siege despite the devastating cost, Israel is responding by tightening the blockade even further. On Monday, Israel announced the closing of Gaza’s only commercial goods crossing. Israel is also reducing the distance Gaza fishers are allowed out to sea from nine to six nautical miles. The steps are collective punishment against Gaza’s two million people for incendiary kites and balloons that Palestinians have launched, setting fire to fields on the Israeli side of the boundary. Israel’s technologically advanced military has proven unable to counter the kites and balloons. So once again, occupation authorities are inflicting more of the suffering that has spurred revolt against a situation in which the population in Gaza – half of them children – can only choose between dying by Israel’s bullets and bombs, or being reduced quietly to desperation and death by the siege. Israel says it will allow in “humanitarian” supplies such as food and medicine, but UN officials are warning that the closure of the commercial crossing will make the situation in Gaza much worse. The closure “can be expected to have profound and far reaching consequences for already desperate civilians,” Chris Gunness, spokesperson for UNRWA, the UN agency for Palestine refugees, stated on Thursday. Gunness pointed out that among the imports banned by Israel were building materials for UN education, health, water, sanitation and hygiene projects. Gaza’s water and sanitation systems are already near collapse following years of Israeli blockade and military attacks. Gisha, an Israeli human rights group that monitors the blockade of Gaza, said that Israel is banning all building materials, not just those destined for UN projects – which will quickly bring all construction in Gaza to a halt. Already struggling businesses will also suffer huge losses. Farmer Suleiman Zurub was waiting to ship 2,000 crates of sweet potatoes out through the crossing. That crop will now likely spoil. “Farmers are the big losers from this decision,” Zurub said, according to Gisha. Hasan Shehadeh, who owns a clothing company, also faces huge losses as he is unable to ship goods to customers in Israel, the occupied West Bank and China. “If things stay this way, I’ll suffer huge financial losses, because in my contracts I’ve signed a commitment to pay for every item left in my factory,” Shehadeh said, according to Gisha. Shehadeh is also worried about the 200 people he employs. “Israel’s decision will affect them too, of course,” he said. UNRWA’s Gunness predicted that the latest closure would lead to an increase in demand for UNRWA services. This would come at a time when the agency, which provides emergency rations, health and education to hundreds of thousands of people in Gaza, faces an unprecedented financial crisis following the freezing of US contributions earlier this year. Nearly 80 percent of Gaza’s population is already forced to rely on humanitarian assistance and the unemployment rate is close to 50 percent. In June, UNRWA warned that it may have to make deep cuts to its already stretched services. Even before the latest Israeli restrictions, UN officials pointed to signs of a sharply deteriorating situation. From January 2017 to June this year, the percentage of essential drugs at a zero stock level in Gaza has risen steadily from one-third to one-half, according to OCHA – meaning there is less than a one-month supply for those medicines. In June, the average number of hours of electricity per day was 4.5 hours, close to an all-time low since January 2017. Meanwhile, over the past year, the number of people who have had to borrow money or food from family or friends rose from about one in three to nearly half. The European Union, which rarely criticizes Israel and has failed to condemn its massacres of civilians in Gaza, said on Friday that it “expects Israel to reverse” the decision to close the commercial crossing. The statement from Brussels made no reference to Israel’s obligations as an occupying power to abide by international law, including the prohibition on collective punishment.